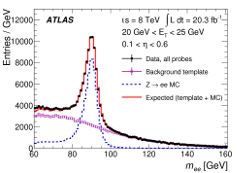 The DESY ATLAS group is involved in the reconstruction and calibration of physics objects, which are the basic ingredients of all physics analyses. This includes the reconstruction of tracks, electrons, photons, jets and the flavour tag for jets. In addition DESY works on the simulation of the tracking detector and the infrastructure for and commissioning of event generators. 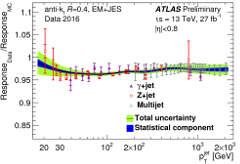 Residual JES vs the jet momentum and its error. DESY is heavily involved in the maintenance of the software environment which is needed to run event generators inside the Atlas software framework Athena. In addition we are working on the commissioning of generators and so that these simulations can be used in physics analysis. Desy is involved in Detector simulation as well. Here we concentrate on the silicon tracking detector for the current and future experiment (ITK) and the frozen shower parametrisation of the forward calorimeter.